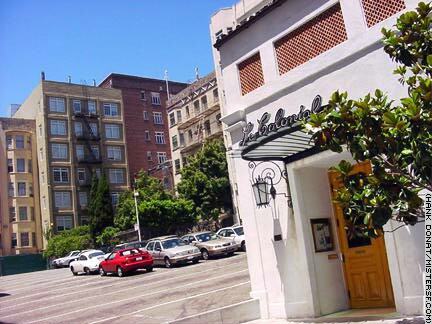 20 Cosmo Place "I knew a great number of my customers in Oakland were from San Francisco and when I felt enough people were interested in a Trader Vic's across the bay, we started to look for a location. Drove up one street and down the next. Finally, I found a parking lot with a garage on it on Cosmo Alley. I looked up the owner and he was willing to lease." That's how it started according to "Frankly Speaking," the autobiography of the late Trader Vic himself, Victor Bergeron. In 1951, when Trader Vic opened his restaurant on this alley street in the Tenderloin, he founded what became the hub of sophisticated night life in the City, a club atmosphere often compared to New York's "21." In addition, the eccentric traveler and restaurateur invented the Mai Tai, mainstreamed Polynesian food in the U.S., and built an international restaurant empire that continues to operate today under Bergeron heirs. The San Francisco location, now the popular Le Colonial Vietnamese restaurant, closed in the early 1990s, but not before carving out an important place in history not only for San Franciscans, but for Britons as well. During her 1983 visit to America, Queen Elizabeth II, who was touring San Francisco with the Reagans, ate a meal for the very first time in any restaurant. Trader Vic's was the place. In Vic's Trafalgar Room, the queen, Prince Philip, the Reagans, and their party were served Indonesian lamb roast with peanut sauce, Chinese pork, smoked salmon, and three California wines. In addition to the wines - chardonnays and a cabernet - the queen had a daiquiri on the rocks and a Tanqueray martini. Dessert was rum ice cream with praline sauce and fortune cookies.